Built c1848, the Marlborough Rooms at 309 Regent Street, which were the venue for magic lantern shows in the 1860s, were chosen by the Lumiere brothers in 1896 to demonstrate their cinematograph. The space was converted to a cinema in 1920 and ran as such until 1980 when it became a lecture hall for the University of Westminster. In 2015, with the support of the Heritage Lottery Fund, it was restored to its former glory and runs today as the Regent Street Cinema, showing a wide-ranging repertory programme. 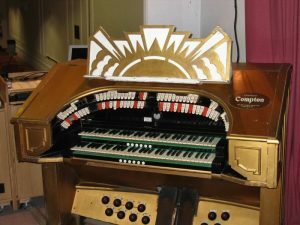 The Compton cinema organ was installed in 1936. It is one of only three such instruments in London remaining in its original location. The organ fell into disrepair following a building accident in the 1990s and remained unplayable for some 10 years before Peter Hammond of HWS Associates carried out a restoration of the instrument over a six month period in the early 2000s, fitting the work in around the University’s busy lecture schedule. Today the instrument is played every Wednesday as part of the Matinee Classics programme, as well as accompanying silent films several times a year. It continues to be an excellent example of John Compton’s smaller instruments.